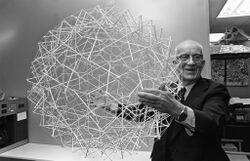 Read here about tensegrity structures composed of 540 struts, part of a series of pages organized by strut count. 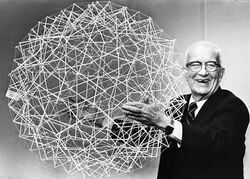 Photographs dated to April 1979 show R. Buckminster Fuller holding a tensegrity sphere composed of 92 Prisms. Its structure, as analyzed by Taffgoch and Adrian Rossiter is summarized below. 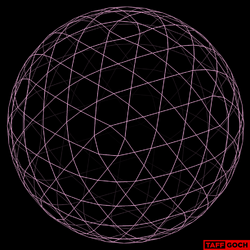 Tensegrity Prism 960 struts by Taffgoch. 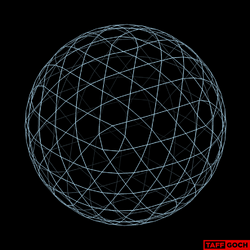 Tensegrity Prism Animated Overlay by Taffgoch. 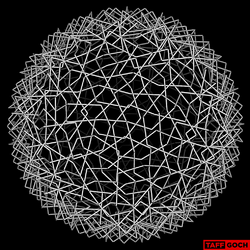 Tensegrity Prism inner tendons icosahedron shown by TaffGoch. Tensegrity Prism one highlighted by Taffgoch. Tensegrity Prism outer and inner tendons by TaffGoch. Tensegrity Prism outer tendons icosa by TaffGoch. 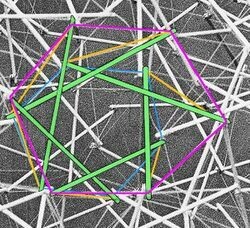 Assuming uniform struts (all the same length), the pentagonal prisms will be 20% higher if they had the same approximate edge length as the hexagons. This longer edge should be visible in the photograph, and may result in a slight twist. The tendon nets could be continuous. 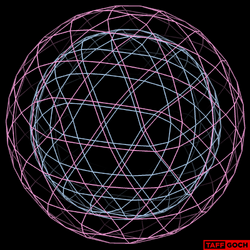 "An undirected graph has an Eulerian cycle if and only if every vertex has even degree, and all of its vertices with nonzero degree belong to a single connected component." Each prism has a winding direction. This page was last edited on 25 September 2018, at 11:54.